Sensei Somnath Palchowdhury the Chief Technical Director of the Indian Federation of Shotokan Karate (IFSK) was born in 1968 and graduated in commerce from the University of Calcutta in 1988. He took up Karate in 1983 in a local dojo. 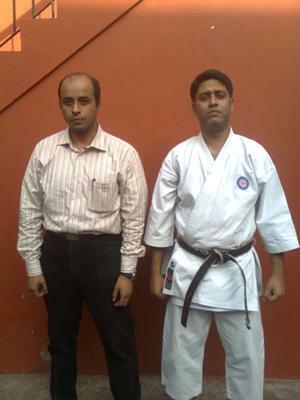 His interest in Karate made him join Calcutta Karate-Do Club under sensei Mrinal Nandi, then a Shotokan Black Belt. In his later years of studying traditional Shotokan Karate-do, he has trained under some of the legendary masters viz. Masters Hidetaka Nishiyama, Hirokazu Kanazawa, Hiroshi Shirai, Hideo Ochi, Takeshi Naito, Masao Kawasoe, Shinji Akita, Nick Adamou, John Van Weenan, Gerry Breeze, Jan Spatzak, Pemba Tamang, Mike Springer, Greg Wallace, John Cheetham, John Errington, Kenny Taylor, Rajeev Sinha to name but a few. To train with many of these masters sensei Palchowdhury had visited England many a times and stayed there from the span of one month to five months each time, since 1990. During these long stays in England he mostly stayed with sensei Nick Adamou, 8th Dan, former disciple of Kanazawa sensei for 24 years and trained and assisted him in teaching in IASK dojos all over United Kingdom. It’s during these days and interactions with many first generation JKA/KUGB/SKI black belts influenced sensei Palchowdhury to become a purist in traditional JKA karate. As a coach he had given instructions in many prestigious institutions which include; Kolkata Police, Central Detective Training School, YWCA of Kolkata, Lattimar Upper School & Harrow Leisure Centre both in London, St. Alban’s School in St. Albans, Hertfordshire, England; apart from teaching in numerous schools and dojos in West Bengal and other parts of the country. His success as a coach reached at its peak when his students received 3 golds and 3 silver medals in IASK Internationals in 1995 in Oxford. His students also shined in SKDUN World Championships in 1997. In the domestic circuit sensei’s group IFSK was inclined to Traditional Karate and therefore his Team Bengal has always been in either first or second position in TKFI (Indian body for ITKF) Nationals. Sensei Palchowdhury received the rank of Shodan from English instructors Greg Wallace (BASKA), Mike Springer & Aidan Trimble (FSK) in 1990 and later also graded under master Kanazawa (SKIF). He is probably the only Indian to have coaching qualification from the English Karate Governing Body (EKGB) and an EKGB & WUKO (now WKF) 2nd Dan. Currently he holds the rank of 5th Dan from FBSKUI & SKDUN graded in February, 2009 by Shihan Gerry Breeze 8th Dan. This rank of sensei is now being registered in the records of AIKF & WKF also. He is also a qualified Kata & Kumite referee with the experience of officiating in Sports and Traditional Karate events in both national and international circuits. He has got a knack of studying and doing research on Shotokan Kata and as such he has a remarkable collection of books and videos on Shotokan Karate. Though a great admirer of Kanazawa sensei, sensei Palchowdhury is actually a diehard fan of both Kawasoe and Osaka sensei and therefore his karate is highly influenced by the JKA Nakayama brand of Shotokan and master Nishiyama which he continues to pass on to his students. While asked on his sole target for future in karate we came to know that he is working very hard ‘to preserve and teach the purest form of JKA Katas in budo form’. He is a real gentleman of Indian Shotokan community; elite, knowledgeable, soft spoken and non-political in his opinion; a pure technician. Interested to read more about his current activities. Yes the best word for him 'The Shotokan Technician'. The title is most appropriate for Mr. Palchowdhury. If you touch with him for good karate, you will be always there for good karate.